On Wednesday, January 23rd, the Allendale Yellow Jackets took on New Hebron in regional semi-final action at Allendale. New Hebron jumped out 8-4 after one quarter of play and never looked back. The Eagles led 26-13 at halftime, 49-21 after three quarters, and then finished the game with the victory at 55-36. Scoring for the Yellow Jackets: JD Bowser with 12 points, Kollin Kelsey with 8 points, Matthew Jackson with 8 points, Trent Casburn with 4 points, Chandler Cusick with 2 points, and Clay Morgan with 2 points. This concludes the season for the A-team, which finished with a record of 7-10. 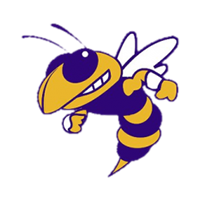 Next up for Yellow Jackets Basketball: C-team tournament at Clay City on Saturday, January 26th. Monday, January 28th will be the Championship Game featuring the 1-seed St. Joe (Olney) taking on the 2-seed New Hebron at 6 pm.